A couple of weeks ago I shared my number one tip for eating gluten free, along with some of my favorite naturally gluten free foods. Today I want to talk about gluten free flour blends. Long time gluten free readers probably already know that I am not a huge fan of gluten free blends. For most things I usually prefer individual flours. They make for the best gluten free cookies, gluten free cakes, and gluten free muffins. I have shared thoughts on gluten free blends before and my thoughts are still pretty much the same. However, I understand why so many people love gluten free flour blends and I do use them some. They have a place in my gluten free kitchen. I recently used them in an apple cake and in apple crisp and both turned out great. 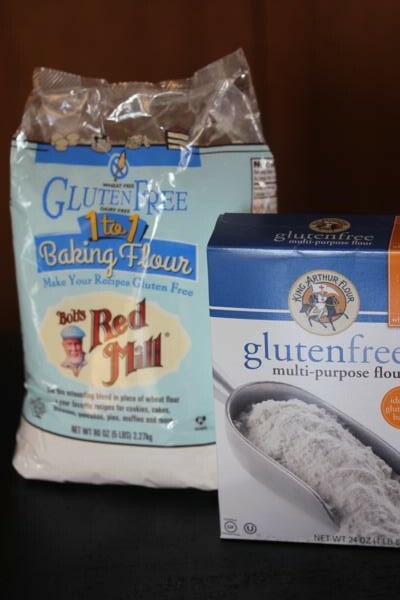 Gluten free flour blends are easy to use and avoid the issue of having to have multiple gluten free flours in your kitchen. With fall and holiday baking coming up I knew I wanted to share a few thoughts on gluten free blends. I also wanted to share the blends that I have had the most success with. If you are new to gluten free, or are unfamiliar with it, you might be wondering what the big deal about gluten free blends is and why so many people make a big deal about having a favorite. The issue is that no one flour can replace regular all purpose flour. It just doesn’t work that way. It takes a combination of flours and starches to get anything close to the results that a regular flour will give you in a recipe. Whether it is a homemade blend or a store bought one, finding a blend that you like can be hard. Gluten free blends are where you realize how much science really is behind cooking and baking, especially gluten free cooking and baking. These are my two current favorite gluten free flour blends. They are the best gluten free flour blend that I have tried. You can almost always find these two blends in my cupboard. When I need to use a blend they are what I turn to. When it comes to most recipes I have had the best success with Bob’s Red Mill 1 to 1 Gluten Free Flour Blend and King Arthur’s Gluten Free Flour Blend. Other blends work, but I have had the most success with these two gluten free blends. There are a ton of gluten free blends that you can buy or make. A quick online search will yield you a ton of results for both, but my favorites are these two blends. I will admit Bob’s Red Mill 1 to 1 blend is my favorite, but King Arthur’s is a close second. Neither company is paying me to say that. I have worked with Bob’s Red Mill in the past, but this is not a sponsored post. If I need a gluten free blend I turn to Bob’s or King Arthur’s. You can buy Bob’s Red Mill 1 to 1 blend and King Arthur Gluten Free flour blend on Amazon, but I have found them to be cheaper at stores in my area. Although that may depend on where you live. These companies have both worked hard to get it right. They have invested time and money to get the right ratio of ingredients. My number one complaint with blends is the gums. The amount of gums that works in a cake may not be the same the works in a cookie or a pancake. Both of these blends seem to have an amount of gums that works in most things. I won’t say all things, because I have had some recipes not turn out, but in most things they work well. Bob’s Red Mill 1 to 1 blend is my favorite because it contains sweet rice flour. I love sweet rice flour for things like cakes, cookies, and muffins. You will find it in many of my gluten free dessert recipes. It gives them a better texture and makes them closer to the real thing. Blends with sweet rice flour are just better in my opinion. If I only had one gluten free blend in my kitchen, it would be Bob’s 1 to 1 blend. If you are new to gluten free or are needing to make a gluten free recipe for a friend or family member, I would recommend starting with one of these blends. They are easy to use in place of regular flour and are pretty readily available at grocery and health food stores. If you are gluten free and have not tried these blends, I think you will like them. Now I would love to hear your thoughts. 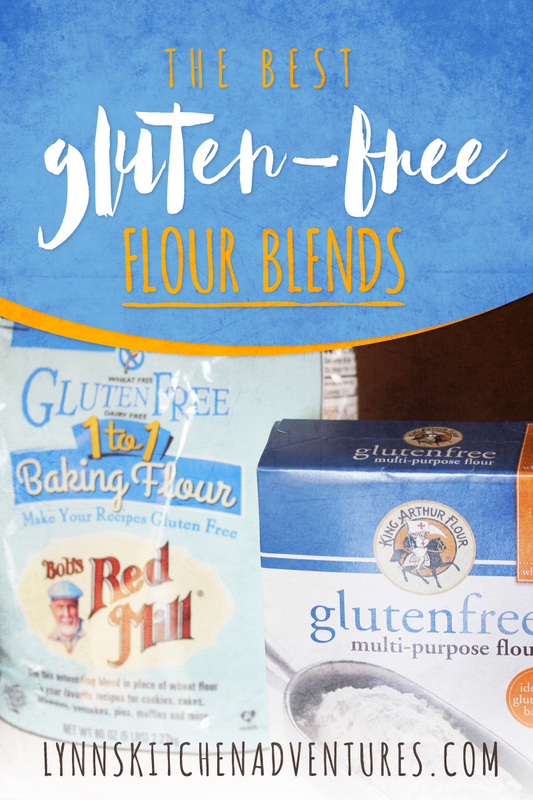 What is your favorite gluten free blend? Is it homemade or store bought? My favorite is Cup4Cup, but I also like Better Batter. I have been wanting to try Bob’s 1 to 1. I really like Better Batter. I buy it in bulk several times a year. I’ve tried Bobs all purpose mix but didn’t like it. This was before the 1 to 1 came out. I might give it a try now. But Better Batter replaces very well in a regular recipe I want to make gluten free. I did not like the older Bob’s Red Mill mix with the bean flour either. The 1 to 1 does not have the bean flours. It is so much better than their old one. Do you buy the better batter in bulk directly from them? Yes, I order directly from them. Plus they often offer discounts on damages and free shipping on their email list. I will have to try the new Bobs mix. I have tried the kind arthur brand and liked it but it is pricey at my local store so I make my own now. I really like the Jeannie mix from Art of Gluten free baking blog that uses sweet rice flour- she has a great recipe for hamburger buns and tortillas,; two items that are not available premade locally. For cakes and cookies I use the Bette Hagman original formulas with 3 parts rice, 2 parts potato, 1 part tapioca. I have also been wanting to try bob’s 1 to 1 but read a few reviews about gummy cakes. I agree about too much gum in premade mixes that is my main reason for not liking them. I reduce the gum in most recipes and sub it with pectin in cakes, cookies and quick breads. Do you have a suggestion for the best gluten free flour to thicken gravies and sauces? Have you ever tried my gfJules Gluten Free All Purpose Flour? It’s non-GMO and top 8 allergen-free. It also has natural preservative properties so your baked goods stay moist and fresh much longer. I like Namaste brand, they sell it at costco. It has worked well for me in pancakes, cookies and quick breads. I have just used regular recipes and just used the gluten free flour. We have found that when we make cookies if we make the dough and let it sit in the fridge overnight that the cookies have a better texture. I also use Krusteaz brand, they have it at Sams Club. Both are only $9 for a 5 lb bag by me. I saw the Krusteaz brand at Sam’s, but have not tried it. I will have to. I am glad to know that you like it. I have tried some of the Namaste products, but have not tried their blend. I need to though. I have problems with both corn and potatoes. I haven’t seen an all purpose blend that doesn’t contain at least one, if not both of those, so I make my own blend with flours from Bulk Barn. I really like the sweet rice flour for my blend for pastries. My daughter is also gluten intolerant and told me about the sweet rice flour. Xanthum gum is also corn based, so I use guar gum instead.